We have already posted a number of concealed handgun permit holders who have used guns defensively during October (see here, here, and here). But here are some more cases that we hadn't previously included. All together there are 18 news stories here. Warren, Michigan (October 4, 2015) -- "A customer who thwarted a bank robbery in Warren Sept. 21 when he used a concealed pistol to shoot the suspect will not face criminal charges, police said after reviewing the facts of the case with Macomb County prosecutors." Plymouth, Pennsylvania (October 5, 2015) -- "Mike Sharma, owner of Quick & EZ Stop, Plymouth called Rob Ragukus 'the best man' on Monday night after he held an alleged would-be carjacker at gunpoint until the police came. 'He saved all of us,' he said." 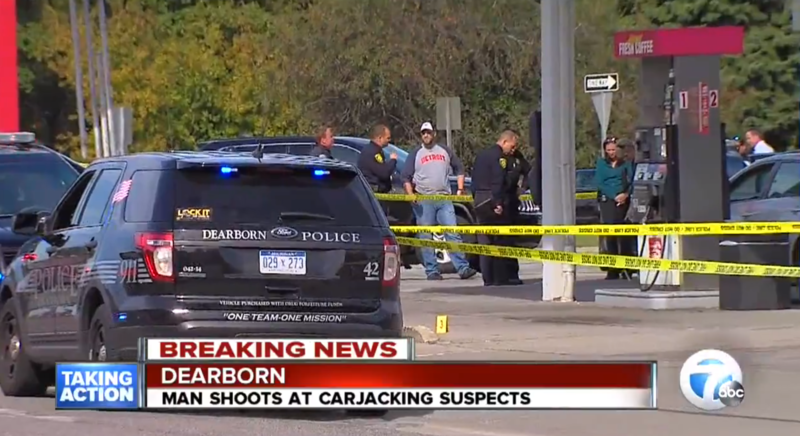 Dearborn, Michigan (October 5, 2015) -- "At least one carjacker approached the car, reached in the window and tried snatching the cellphone. Witnesses say an argument then took place over the driver's wallet. The suspect apparently punched the driver in the face. That's when witnesses say the driver took out a gun and shot at the suspect." Joliet, Illinois (October 6, 2015) -- "About 1:30 a.m., a 65-year-old man came home to the 500 block of Strong Avenue and was approached by an armed man in his driveway who demanded money, according to Joliet Police Chief Brian Benton. 'The victim pulled a legal concealed-carry weapon and he and the suspect began to shoot at each other,' Benton said." Sarasota, Florida (October 6, 2015) -- "Surveillance video obtained exclusively by the Herald-Tribune appears to buttress claims by the attorney for a 22-year-old Sarasota man involved in a "road rage" shooting on Monday who says his client was only acting in self defense. . . . . Gunter's defense attorney, Jeffrey Young, says the shooting is a classic example of a "Stand Your Ground" defense." Houston, Texas (October 9, 2015) -- "One person is dead and another is injured after they allegedly attempted to rob a man carrying a concealed handgun early this morning. The suspects approached the man with a gun as he was walking on the 600 block Cypress Station Drive around 1am. That's when deputies say the man surprised the would-be robbers by pulling his own handgun. He fired the gun at both suspects, killing one of them." Toledo, Ohio (October 20, 2015) -- "Terrance Reid, 21, arrived home from his job as a welder at about 4 a.m. when police say he was approached in the front yard by Antonio Hadley, 40, of Toledo, just outside the house, WTVG Channel 13 reports. . . . Reid, who has a concealed-carry permit, pulled out a handgun and fired several shots at Hadley, who ran away, police say. Reid then called 911." San Antonio, Texas (October 20, 2015) -- "Officers were called to a Chevron station on the 600 block of Division shortly before 1 p.m. Tuesday. Police were told a man caught another man trying to break into his car, which was parked at the station. They say the car owner pulled a gun and shot at the suspected car burglar, who then ran to a “getaway car” and sped off." Jacksonville, Florida (October 25, 2015) -- "Police say a Domino’s delivery driver was delivering pizzas near Timothys Landing off 103rd street when he was approached by two armed man, demanding money. The Jacksonville Sheriff's Office said the deliveryman grabbed his own gun and shot one of the suspects. Action News Jax spoke with crime and safety expert Ken Jefferson . . . . “This is a clear case of self-defense this person was working and was approached by two armed men,” said Ken Jefferson."